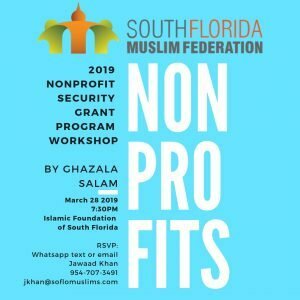 (Sunrise, FL, 03/28/2019) – The South Florida Muslim Federation held a workshop on Thursday, March 28th for the masajid, Islamic centers, and non-profit organizations of the South Florida Muslim community geared around the FEMA Nonprofit Security Grant. The grant is offered every year to nonprofits to specifically fund increased security measures at their centers (security cameras, outdoor gates, bulletproof windows, and other security measures are common uses of the grant). Representatives from the Federation’s member organizations were present, including Al Amin Center of Florida and the Islamic Center of South Florida. It was held at the Islamic Foundation of South Florida. The workshop provided guidance and access to direct resources (in the form of a grant writer) to aid the masajid and centers in applying for and receiving this grant. 1. Make sure to register with the federal government grant website. 2. Conduct a vulnerability study with your local law enforcement agency. 3. Have someone knowledgeable complete the grant application. In the wake of the tragic New Zealand mosque attacks, Islamic centers and masajid across South Florida are having more and more talks on increasing the security of our communities and making sure we are all taking measures to prevent any such incident. In addition to this workshop, the Federation has provided security trainings at several masajid and will continue to convene with the leadership of every masjid to make sure our communities are safe and prepared. We ask Allah to protect us and our communities.